Looking for that unique costume that will make heads turn at your Halloween party? Then why not opt for a luminous cape created by UK-based artist and designer Kasia Molga? 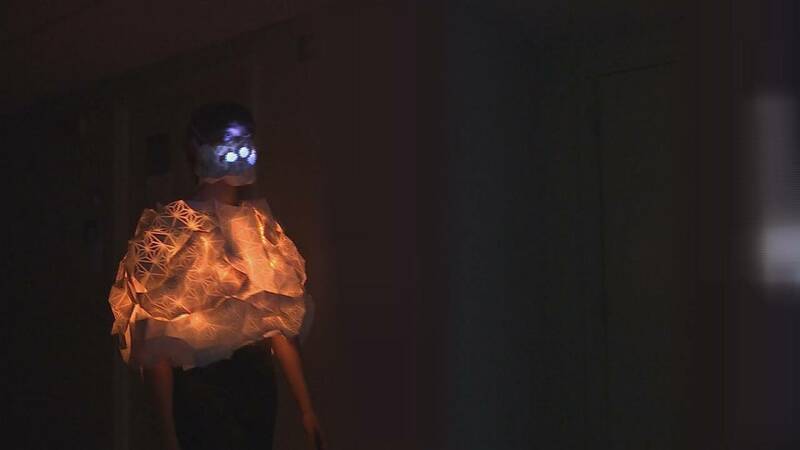 Composed of laser cut plastic glued to polycotton cloth, the cape turns red when you walk through a polluted zone. Its lights are calibrated to change depending on the information supplied by data collected around you. The project is being produced by commissioning organisation Invisible Dust, which works with artists and scientists to explore climate change and pollution. Molga linked up with scientists at King’s College London to develop the clothing. Among them is air quality analyst Andrew Grieve. He is equipped with a monitor that demonstrates the difference in air quality in different parts of London. “What we wanted to do on this project was make pollution visible, in a sense, and make it visible on the street where people are, where people are exposed, where the public is and really show people how pollution can change even from a junction to a park next to it,” he explains. Back in his lab he checks the results of his brief walkabout. A graph shows the variations in pollution levels. Weather conditions make an obvious difference. “You can see that just being closer to the traffic at the roundabout really gives you a significant kind of spike over what you experience even on the bridge. It was a very windy day today, but despite that wind we still saw some significant peaks closer to the traffic than we did further away,” he says. According to researchers, while there is an obvious need to bring down general levels of harmful gases, highlighting the worst areas would give people a chance to exercise some control over their health.